Between efforts to stamp a time of death on the Laker dynasty Monday night, conversation occasionally veered toward figuring out how the Thunder had so easily dispatched their veteran opposition. Speed? Explosiveness? 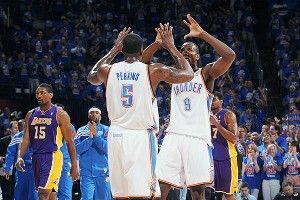 Sure, that might have had something to do with it, but the Thunder were fast two years ago, too, and the Lakers were able to dispatch them in six. The Lakers might be slower now, but what’s the tried-and-true effect produced by a maturing young team? Right! It’s screwing up less. And in the Thunder’s case, the easiest way for that to manifest itself was by reducing their turnover rate. During the regular season, Oklahoma City turned the ball over on 15.3 percent of their possessions, the highest rate in basketball. In their five-game victory over Los Angeles, though, Russell Westbrook & Co. only turned the ball over on 9.9 percent of their possessions, which would be the best turnover rate in basketball if they could sustain it for a full season. Let’s spare you the regression-toward-the-mean speech. Even if you think the Thunder are making better decisions with the basketball and avoiding sloppy play, going from worst to first in the course of three weeks is pretty unlikely. You get that. There’s a hidden factor, though, that’s driving a significant amount of Oklahoma City’s improvement: strength of schedule. Or, more accurately, lack of strength of schedule. Do you know which team was least likely to force a turnover on a given possession in 2011? Why, it was the Los Angeles Lakers! They produced a takeaway on a league-low 10.7 percent of possessions this season, and most of that came before adding noted defensive sieve Ramon Sessions to play point guard. In this battle of turnover-friendly offense versus takeaway-shy defense, the offense prevailed. 13.9 percent of their opposition’s possessions. That’s average, and while average is still significantly better than the terrible turnover rate the Thunder had during the regular season, it’s not enough to justify believing that they’ve fundamentally changed their game during the playoffs. So, with the Thunder about to line up against the veteran Spurs, it’s reasonable to expect a series where the old dogs clog up passing lanes and trick their younger opposition into making mistakes. Right? Well, not so fast. Again, consider their established rate of performance. The Spurs only forced turnovers on 12.9 percent of opposition possessions this year, which was the seventh-lowest rate in the league. And before you can say “But Manu Ginobili?!? !,” this isn’t a one-year trend for the Spurs. They had the league’s fourth-lowest turnover rate in 2010-11 and the third-lowest rate in 2009-10. The Spurs play solid defense, but that defense doesn’t manifest itself through tons of takeaways. Instead, the place where turnovers might really begin to hurt the Thunder would be in a potential Finals matchup with the two favorites out of the East. The Heat (third) and Celtics (fourth) ranked among the league leaders in forcing turnovers. So, if the Thunder continue to avoid turnovers against the Spurs before breaking down in a flurry of sloppiness during the Finals, realize that they were mostly the same team all along. It was just the opposition that changed.